Perhaps the desert isn’t the loneliest place in the world after all. In the 1960s the American telephone company placed a phone booth in the middle of the Mojave desert, 13 kilometres from the nearest town to facilitate those who worked at the volcanic cinder cone mines. In 1997, two years after the Internet had been commercialized, the phone booth became an online phenomenon. After an underground magazine published one man’s journey to the phone, several websites listing the phone’s number where created. People called the phone to see who would answer. Others would camp out by the phone, waiting for it to ring. In the middle of nowhere, the Mojave Phone Booth served as a spiritual conduct for those who were lost, and those who wanted to be found. It offered a connection. A land line. A voice to listen to, or a person to talk with. The phone booth connected strangers in a way no other booth could. 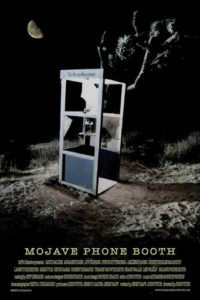 Although the phone was taken down in 2000, it’s spirit remained, remembering everyone that whenever you cry out for help, there might just be someone out there to answer your call… “Mojave Phone Booth” (2006) is a fictional recollection of what life on the desert-side of the booth might have been like. It is a sweet movie about the call of everyday life, and which moments we decide to record in our memories.